 Log In needed $549,900 · Gorgeous Renovations in the Properties! The updates have already been done for you in this 1,936 sq ft 3 bedroom home. Flooring, paint, windows, tiles, countertops, cabinetry and appliances have all been beautifully transformed into a 'new' home. 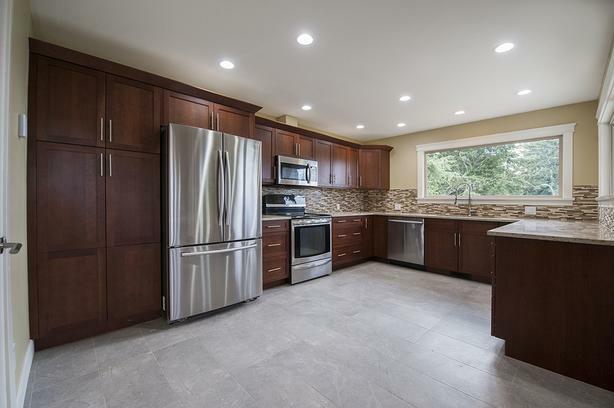 The kitchen is highlighted with Cherry Wood cabinetry, quartz countertops and mosaic tile backsplash, heated tile flooring, stainless steel appliances and large windows to take advantage of the mountain views. The cedar planked vaulted ceilings, hardwood floors, bank of windows and natural gas fireplace showcase the living and dining rooms. The main floor offers a 4 piece bathroom, two spare bedrooms, and the master bedroom. The master has a walk-in closet and a 3 piece ensuite with amazing shower. The lower level provides additional space with a family room, laundry and a large unfinished crawl space that has 8' ceiling and lower. The property offers thermal windows, garage, RV parking and low maintenance landscaping. Located in the 'Properties' you are close to endless trails and recreation.